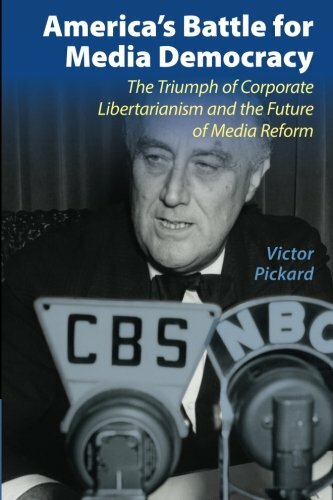 Victor Pickard is a relatively new author on the subject of media policy and history. In a well-documented and thorough treatment of the subject, he illustrates what has been done to reform the media, but each attempt appears to lack the necessary “heft” to push back against the corporate giants. The genesis of today’s situation finds its roots in the the Post-WWII era when giant corporations set the stage for a high profit margin and only a tepid nod to public service requirements. There were, according to the author, other options than the road that was taken. A different media system was—and still is—possible; however, it involves overcoming the resistance of formidable giants. Much is written about the post WWII era and the results of policies that were put into place at that time. However, little was done to synthesize this information until now. The Bluebook – The FCCs most progressive initiative. The Bluebook proposed retention of License contingent upon meeting substantive public interest requirements. Mayflower Doctrine – Prohibited political editorializing (This gave way to . . .
. . . The Fairness Doctrine – Stations could choose programming, but provide a reasonable opportunity to hear different opposing opinions on issues of public interest in the community. Now largely forgotten. Corporate backlash always seemed to wipe out attempts at reform. The Hutchins Commission – The product of media moguls Henry Luce and Robert Hutchins—studies the question of freedom of the press and what responsibilities it entailed. The author credits this Commission with significant norm setting power; however, the industry lapsed into self-regulation. While not entirely successful, these efforts sought to ensure that profit was not the only element of importance. Still, none had the force of big business in moving the agenda of the media forward. The author sees the present circumstance as a time when change is possible. Today we decry 200 TV Channels and nothing to watch. The listeners of radio in the 1940s felt the same way about “soap operas” and the low-grade (and sometimes racist) quality of programming. Reform and defense of free speech arguments proliferated, but did nothing to enhance the quality or the focus on the public good. Yet it is doubtful that this book will be read by members of grass roots organizations, which is another element recommended to launch significant change in current policy. In his conclusion, the author brings the crisis of journalism to the problem of the digital age. Here we see the same disparities of access, costs for service and oligopolies. We see the same problems of the 1940s revisited. The public good falls prey to the profit and power motives. In 2011, for example, the FCC issued a report entitled “The Information Needs of Communities” it suggested only a minor role for public policy in addressing contemporary needs and reinforced the anti-regulatory mantras of years past. There is hope. “Government has a legitimate duty to step in where the market has failed” America makes a poor showing among developed nations with regard to internet access, speed and cost. The author suggests broadband community initiatives in those states that have not passed laws prohibiting municipalities from offering these services (There are 30 such states). Government can also regulate content if it sets its policies to do so. Media Company owners cry “First Amendment rights.” The author cites the content and opinions offered by the BBC, which do not always concur with the subsidizing hand of its government. Strengthening existing Public Media Outlets would also assist in this endeavor. Are we truly at a crossroads with potential reforms possible? Representatives from various sectors are now vested in changing the status quo, (especially those whose jobs are in jeopardy). Is the infrastructure supporting these ideas strong enough to carry them through? That is unclear. Are we willing to test alternative models and rise above the protected status quo, or will the opportunities once again be lost as they were in the reforms attempted in the post 1940’s era. It is unclear whether the author is optimistic here, but at least he offers some ideas that could be tried. Where will this initiative originate if not with government? Is government (given the evidence of the 2011 FCC report) lukewarm in its motivation to intervene? The future remains vague, and true change is uncertain. America’s Battle for Media Democracy is an important adjunct to the body of literature regarding media democracy. The reforms lack the muscle that could only come from some sanctions on media conglomerates and license revocation made possible. Given the revolving door of media workers migrating between the public and private sectors and the bevy of lobbyists advocating the status quo, expecting major policy changes could be wishful thinking. Let us hope Victor Pickard is right in being optimistic.